PR professionals last night rounded on the fashion PR boss who unwittingly played a starring role in a BBC documentary about social mobility. Modus Publicity director Julian Vogel featured in the BBC2 programme Who Gets The Best Jobs? when his agency was exposed on TV as employing up to 20 unpaid interns. Vogel told reporter Richard Bilton that interns were 'a really vital resource'. But he admitted that by not paying them, 'I do worry sometimes that it does favour the slightly better off'. 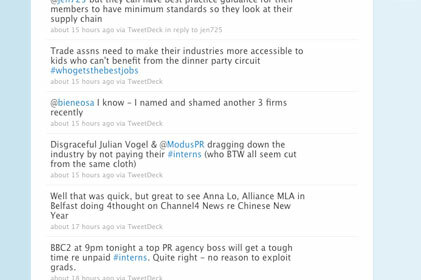 If their Twitter feeds were anything to go by, fellow PR professionals tuning in to the programme were largely unimpressed with Modus' approach to the use of interns. But speaking as the programme was due to be aired, a frustrated Vogel insisted that Modus was not alone in employing numerous unpaid interns.